Now you can see what other guests and owners have to say about Oyhut Bay Resort Seaside Village. Will definitely come back to stay longer! A lovely spot - clean unit with a beautiful, well-stocked kitchen! Gorgeous place! I was looking for a getaway for spring break for my children and I. I never considered going and doing a little staycation. I googled cottages in Ocean Shores and your website came up. Everything about I had a truly fulfilled what my family and I are looking for. What was supposed to be a little getaway turned into wonderful memories and a great time together as a family . We will definitely return and we look forward to her I had bay being A family tradition. Our stay was awesome! We will be back! Thank you! We enjoyed a very relaxing time in Willowbridge Cottage. The cottage was clean and very comfortable for our stay! We loved the outdoor opportunities on the property, like outdoor chess, horseshoes, and a fire pit, as well as the quick drive to Damon Point Beach. It was also convenient to have a restaurant and a grocery store within walking distance. We hope to visit again! Homes were clean, well equipped, and beautiful. We loved the cottage and the neighborhood. We definitely plan on returning again next year. 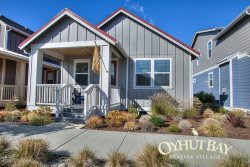 One of the very best rental properties in Ocean Shores. Should I be looking for a rental investment on the coast, Oyhut Bay would certainly be one of my first considerations. Only place to take the family for an ocean vacation. We really enjoyed our stay and had a great family vacation. Having a kitchen available for light meals was really nice.